Back in October I attended the annual meeting of the Society of Vertebrate Paleontology, held at Albuquerque, New Mexico. 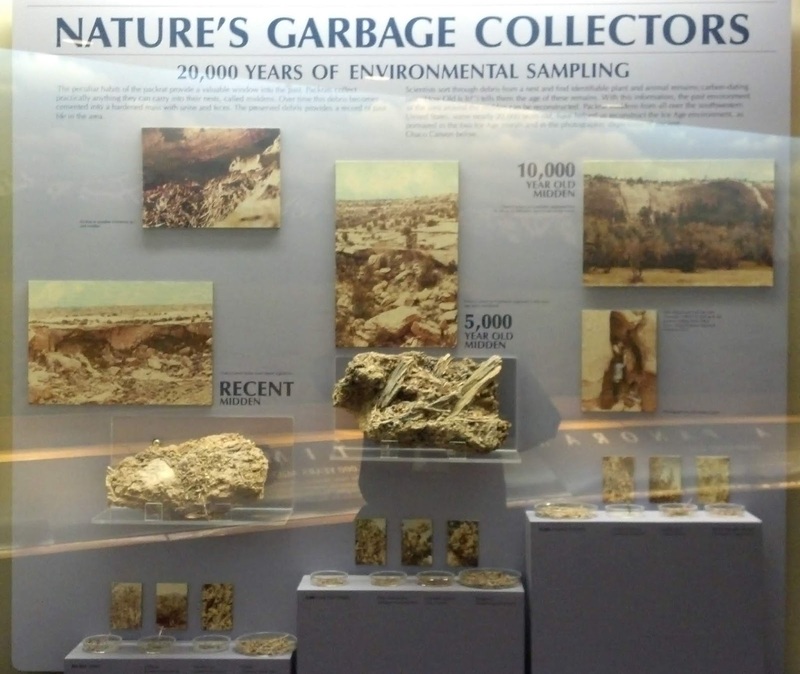 The meeting was co-hosted by the New Mexico Museum of Natural History and Science. Part of the program of the annual meeting is a reception at a co-hosting institution, where the attendees can mingle among the institution's exhibits. I was fortunate enough to be in the company of JP and Sarah Hodnett, who are very familiar with the museum. (In fact, we'd actually spent most of that day there already, working the National Fossil Day event.) Thanks also to JP and Sarah for helping me get around Albuquerque! 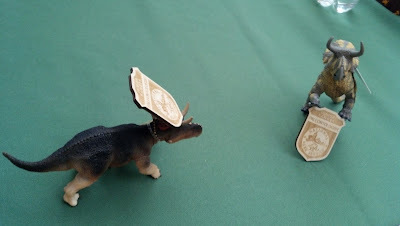 We also had the able assistance of ceratopsids for National Fossil Day. 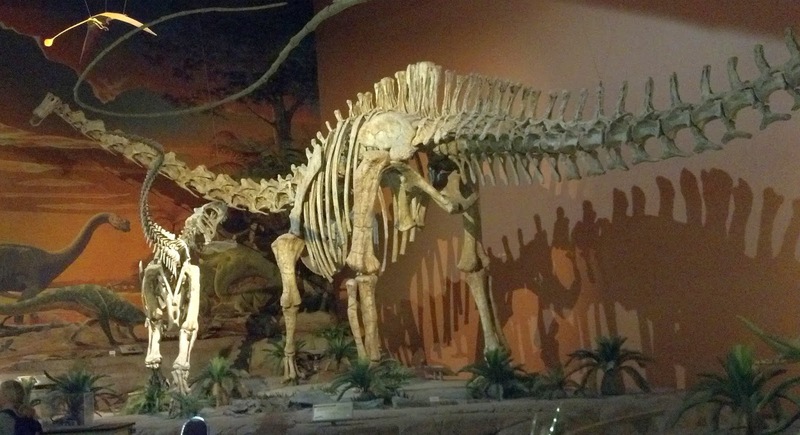 Outside of the museum are two dinosaur statues, representing Albertosaurus and Pentaceratops. 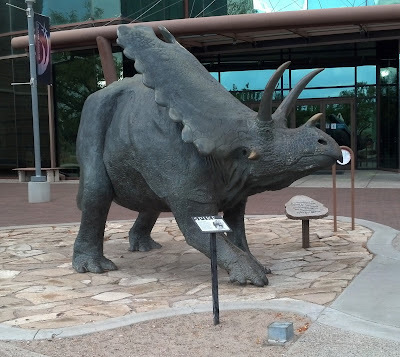 Seeing the Pentaceratops was a bit of a blast from the past for me: I remember seeing the statute being installed in a clip in a TV paleo special back in the 1980s. Or at least I *think* I remember seeing it. Memory's funny that way. The museum had a number of specimens of unique New Mexican forms on display. In terms of dinosaurs, New Mexico is noted for Upper Cretaceous species that haven't been found elsewhere. Many of these species are not as familiar as their northern counterparts, due to having been described much more recently and being known from less complete remains. Above: Bistahieversor sealeyi (holotype). Below Naashoibitosaurus ostromi (cast of holotype). Sorry, no scale. Bistahieversor and Naashoibitosaurus are both from the Kirtland Formation of the San Juan Basin (northwestern New Mexico), albeit different members of the formation. Bistahieversor spent time under both "Aublysodon" and Daspletosaurus before receiving its own genus and species, while Naashoibitosaurus was split between Kritosaurus (head) and Edmontosaurus (body). You can think of Bistahieversor as the local holder of the tyrannosaurid franchise and Naashoibitosaurus doing the same for saurolophines/hadrosaurines. Above: Sphaerotholus goodwini (holotype). Below: Stegoceras novomexicanum (holotype). I don't think we've ever had pachycephalosaurs featured on this blog before. 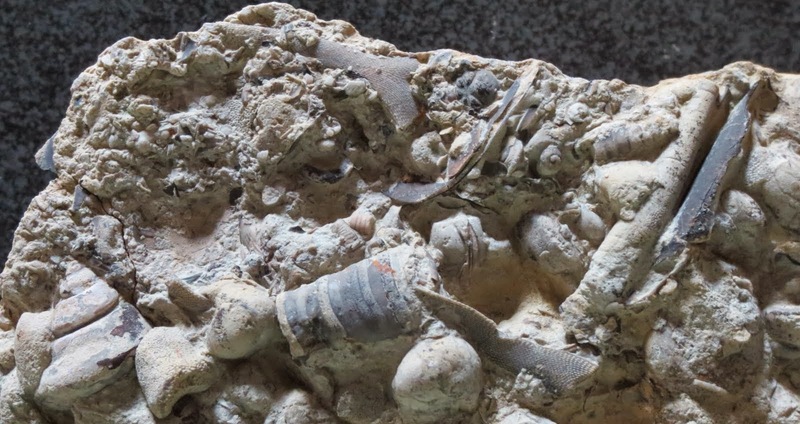 The two specimens above represent a couple of San Juan Basin species, Sphaerotholus goodwini (Kirtland Formation) and Stegoceras novomexicanum (Fruitland Formation, a bit older). They are not large fossils as far as dinosaur skulls go, and in fact frontoparietal domes like these are usually about as good as you get with North American pachycephalosaurids. Did you know that hands have never been described for pachycephalosaurids? The holotype of Ziapelta sanjuanensis, worthy of a spot all to itself. Ankylosaurs are always welcome at Equatorial Minnesota. Ziapelta sanjuanensis, an ankylosaurid from the Kirtland Formation, is a recently described species (2014). It is based on the fine specimen in the photo above. 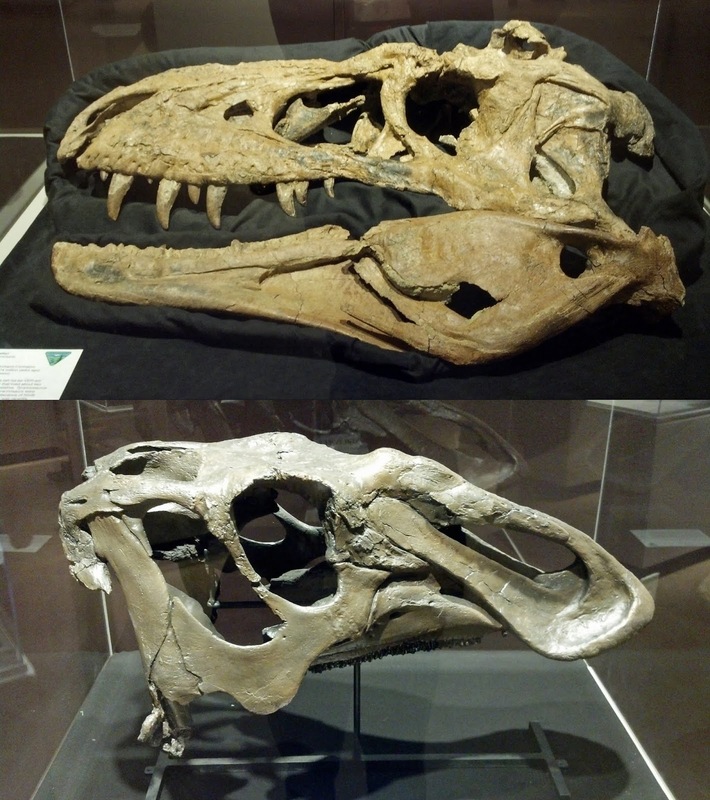 You can see the skull, which is fairly narrow across as ankylosaurid skulls go and is equipped with large squamosal horns, plus parts of two half-rings of cervical armor. Haven't had an aetosaur here before, either. Of course, it wasn't all dinosaurs. The preceding photo shows most of a flattened but articulated aetosaur, a type of armored reptile from the Late Triassic and a distant cousin of crocodilians. This one is Typothorax coccinarum. 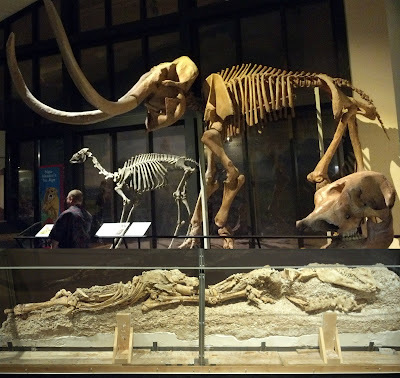 There were also plenty of Pleistocene mammals to be seen, including the remains of mammoths and mastodons, and one narrow block that held a nearly complete bison skeleton and part of a camel, discovered in a fissure deposit. One more for the packrats! Finally, I certainly couldn't pass on photographing this exhibit, given our previous explorations of packrat middens.